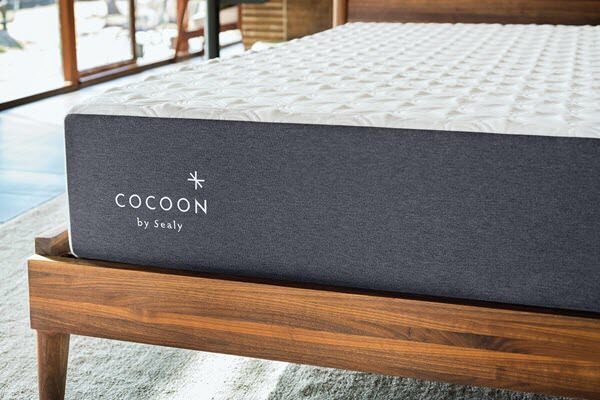 The Cocoon is a new mattress being offered by Sealy, one of the biggest names in mattresses for awhile now. It is a memory foam mattress offered in two different styles for different firmness. We’ll take a look at both of the mattresses here, and let you know how they are. Keep reading to see our full review! 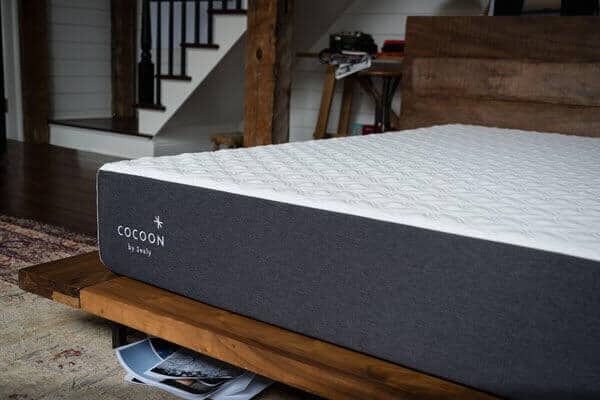 Should I Buy the Cocoon Mattress? The soft and firm versions of the Cocoon have different designs in terms of the layers used. We’ll look at each of them here. Top – the top layer is made from 2” of memory foam. The memory foam layer provides comfort and support for sleepers, and does a good job offering pressure point relief for most people. Middle – the middle layer is designed as a support and transitional layer. It consists of 2” of transitional poly foam, and does a great job easing the sleeper into the firmer base layer. Bottom – The bottom layer of the mattress acts as support and foundation. It is made from 6” of base foam and offers deep compression support as well as acting as the foundation for the mattress. As you can see, the 3 layer setup is designed to provide a feel that isn’t as firm compared to the other version of the Cocoon mattress. Top – the top layer for the firm Cocoon is made from 2” of memory foam. This acts just like the top layer of the softer version of the mattress, and works to provide initial comfort and pressure relief. As you can see, the primary difference between the softer and the firmer version of the Cocoon mattress is that the softer version adds a middle layer and takes 2” of the base layer to create a softer sensation for that mattress, whereas the firm option has an extra 2” of base material to provide a firmer feel for the sleeping surface. One of the unique things about the Cocoon is that it has two different options for the cover. One of the covers is the basic one, and the other option is the Cocoon Chill. The Chill has a phase changing cover that is a bit more advanced than the classic option. The basic Cocoon cover is very straightforward. It is made from cotton and polyester, creating a very soft and breathable sleeping surface. The airflow it allows helps to keep the mattress itself cool, and also works to keep sleepers cool while they are using the mattress. The Chill cover is a bit more advanced. The phase changing material means that the cover is actually cool to the touch. Phase change material works by storing and absorbing the body’s heat, which means that it acts like a temperature regulator, helping to keep the mattress and sleeping surface at around the same temperature as your body. The Chill cover is still soft and breathable, and is very stretchy. The cover also has a unique look to it. While it still uses the white and grey color scheme, only the foot of the mattress has the grey side panel. Additionally, they both have a quilted diamond pattern on the top fabric that gives the mattress a sharp look. On a scale from 1-10, with 1 being the least firm and 10 being the most firm, the Cocoon medium rates at about a 6. The Cocoon firm comes in at an 8. This means that there will be a dramatic difference in the firmness of the different mattresses, and buyers should pay close attention to which one they are ordering. Both mattresses offer a balanced support feel. Sleepers won’t feel like they are sinking or being folded into the mattress. Moreover, sleepers can enjoy any sleeping position they prefer and still get the support they need without pain and comfort. The main difference here between the two mattresses is that the softer mattress allows you to sink in a bit more due to the middle transitional layer of foam. There have been some complaints that the firm Cocoon mattress feels like hitting a wall once you’ve exhausted the top layer of support. This makes sense, given how firm the mattress is and the lack of a transitional layer that can help sleepers ease into the bottom support layer a bit more. However, this does create a good floating sensation that many people still enjoy from a mattress. The bounce and motion transfer of the mattress are the next topic we’ll cover. The mattress still performs like a memory foam mattress, which means there’s not a whole lot of bounce. The motion transfer control of the Cocoon is almost second to none though, which makes it a great option for light sleepers and people who have different sleep schedules than their partners. 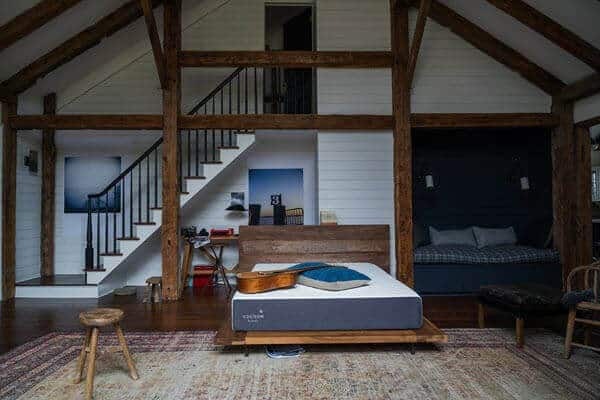 Some couples will be a bit dismayed at the lack of bounce in the mattress, but it isn’t any worse than you would expect from any memory foam mattress. The Cocoon also does a great job when it comes to cooling. The Chill does an exceptional job with cooling due to the advanced materials used in the construction of the cover. If you love memory foam, but don’t like the heat that the material can create, then the Chill cover is a must-have for you. We conduct sinkage tests on all of our mattresses so that you can get a better idea how they’ll perform in real life situations. Our sinkage tests are designed to identify problems with pressure points, as well as to give you an idea how the mattress will hold up. Our tests are done with an individual who weighs ~140lbs, so your results might be a bit different. Laying on Back – laying on the back in a normal sleeping position with weight spread evenly produced 2” of sinkage. Standing in Middle – standing in the middle of the bed with both feet created 5.5” of sinkage. For the Cocoon Firm we got the following numbers, these tests were done in the same as the soft. As you can see, the sinkage from the softer mattress is about an inch greater than the firm mattress. Both mattresses have above average edge support in terms of what you’d expect from a memory foam mattress, which makes them good options for couples looking to get creative with adult fun time in bed. The firm and soft versions of the Cocoon have the same price, but we’ve included a chart that has the pricing for mattresses that have the Chill cover, as it adds a bit to the cost to get the advanced materials and phase changing qualities. Shipping – Shipping is free in the USA, and most order will get to your house in less than a week. The mattress arrives compressed in a box. Trial – Sleepers get 100 nights to try the Cocoon out. There are plenty of people who would love the Cocoon mattress. The fact that it comes in different firmness options only expands the range of sleepers who would enjoy this mattress. Additionally, the Chill cover opens up a whole new market. Particularly, the Chill cover is great for people who like to be cool when they sleep, but who want the qualities and characteristics associated with memory foam like hug and contour which you can’t get on a hybrid, coil or traditional mattress. Additionally, the Cocoon is good for those who want to buy from a known company, as Sealy has been in the mattress industry since 1881. This means that they have a much longer history and track record than many of the other foam mattress retailers, many of whom have only been in business for five years or less. The Cocoon is also a good choice for couples and light sleepers, as it does a great job at controlling motion transfer, and will help couples with different sleep habits rest together without disrupting one another’s sleep. This is also true for people who toss and turn in bed a lot or have a hard time finding a comfortable position while they are sleeping. On the whole, the Cocoon is a good mattress option for many different sleepers, and there is a wide audience who will enjoy it. It uses innovative technologies to provide a cool sleeping experience, and the fact that it comes in different levels of firmness mean that you should be able to pick one that works best for your particular preferences. Sealy is known to distribute promotional codes on the internet, and savvy shoppers should be able to find an even better deal than the price that Sealy already offers.